Home / Health / Healthy habits / Why your doctor doesn’t shake hands? Find out! 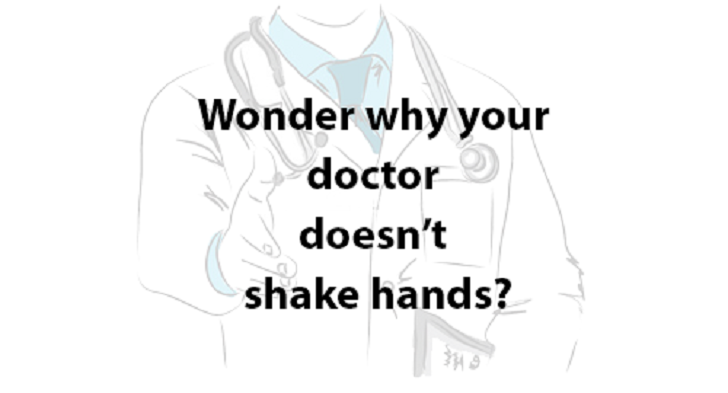 Why your doctor doesn’t shake hands? Find out! Do you remember the last time your doctor shook your hand as you settled into the consultation room? Or parted your shoulders as you went out the door? It may all not be too obvious, and some people wouldn’t want to shake hands anyway. But there has been an ongoing observation of almost cold and impersonal interactions with doctors. Why is this the case? A simple handshake as you walk into the doctor’s office quickly breaks the ice and makes you feel wanted. But hands are also known to pass on more than just a warm feeling. Our hands come into contact with all sorts of bugs as we go through our daily chores. The more we exchange handshakes, the more the potential to transmit organisms to others. This is more so in healthcare facilities where bugs are lurking in all places, waiting to be passed on to others. And not everyone observes strict hand hygiene. Doctors are wary of shaking every patient’s hand for good reasons. Everyone walking in has the potential to pass on something different. The doctor runs the risk of becoming the central point of passing on bugs between patients. So what’s the way out? A ‘no-handshake’ policy. Or an enforced hand sanitization for all patients as they come in, with the doctor sanitizing theirs after every consultation. Others have found alternate ways of making you feel wanted. A warm smile as you walk in will do in most cases. Some have tried a friendly wave, while others have gone as far as gesturing with a fist bump to limit hand contact. Some gestures are plain comical, like the elbow bump which most of us can hardly master. But all are for the good, you are better off with trying to contain only your own bugs. Others can keep theirs. But don’t be a hypochondriac, quickly hiding your hands when your doctor extends theirs for a handshake. Your doctor very likely washes their hands with an antiseptic as soon as they finish with one patient. By the time your turn comes, they are already with clean and uninfected hands. If in doubt, you are free to ask if their hands are clean enough to touch yours. But make sure you keep your end of the bargain, your hands should always be clean enough to touch others. If you encounter some indifference in healthcare, take a back-step just to be sure it’s not meant for your own good. You are better off missing a few handshakes if it means avoiding coming into contact with unwanted bugs. A medical examination is an entirely different matter, but must also be done with all precautions in place. Don’t crave for any physical contacts with health care workers that you don’t really need. You may end up with more than you bargained for.